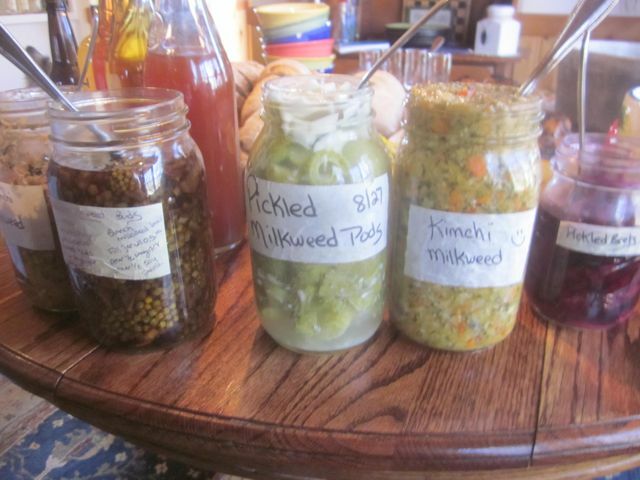 You can read more about my obsession with fermenting vegetables especially wild ones at this post. Wild addition: Milkweed at any stage (shoots, flower buds, flower pods), Cattail shoots or heads, Nettle, Lambsquarter, Dandelion, Chickweed, Purslane……… Use what you have. Place vegetables, ginger, garlic, red chile flakes, sea salt and whey in a bowl and pound with a wooden pounder or a meat hammer to release juices. Place in a quart sized, wide mouth mason jar and press down firmly with a pounder until the juices come to the top of the cabbage. The top of the vegetables should be at least 2 inch below the top of the jar. Cover tightly and keep at room temperature for about 3 days before transferring to cold storage. This make a wonderful addition to Chinese eggrolls. In a bowl, mix cabbage with caraway sees, sea salt and whey. Pound with a wooden pounder or a meat hammer for about 10 minutes to release juices. Place in a quart sized wide mouth mason jar and press down firmly with a pounder until juices come to the top of the cabbage. The top of the cabbage should be at least 1 inch below the top of the jar. cover tightly and keep at room temperature for about 3 days before transferring to cold storage. The sauerkraut may be eaten immediately, but it improves with age.